Building a quantum computer that can solve practical problems that would otherwise be classically intractable due to the computation complexity, cost, energy consumption or time to solution, is the longstanding goal of the Google AI Quantum team. Current thresholds suggest a first generation error-corrected quantum computer will require on the order of 1 million physical qubits, which is more than four orders of magnitude more qubits than exist in Bristlecone, our 72 qubit quantum processor. Increasing the number of physical qubits needed for a fault-tolerant quantum computer while maintaining high-quality control of each qubit are intertwined and exciting technological challenges that will require inventions beyond simply copying and pasting our current control architecture. One critical challenge is reducing the number of input/output control lines per qubit by relocating the room temperature analog control electronics to the 3 kelvin stage in the cryostat, while maintaining high-quality qubit control. As a step towards solving that challenge, this week we presented our first generation cryogenic-CMOS single-qubit controller at the International Solid State Circuits Conference in San Francisco. Fabricated using commercial CMOS technology, our controller operates at 3 kelvin, consumes less than 2 milliwatts of power and measures just 1 mm by 1.6 mm. Functionally, it provides an instruction set for single-qubit gate operations, providing analog control of a qubit via digital lines between room temperature and 3 kelvin, all while consuming ~1000 times less power compared to our current room temperature control electronics. Google’s first generation cryogenic-CMOS single-qubit controller (center and zoomed on the right) packaged and ready to be deployed inside our cryostat. The controller measures 1mm by 1.6mm. 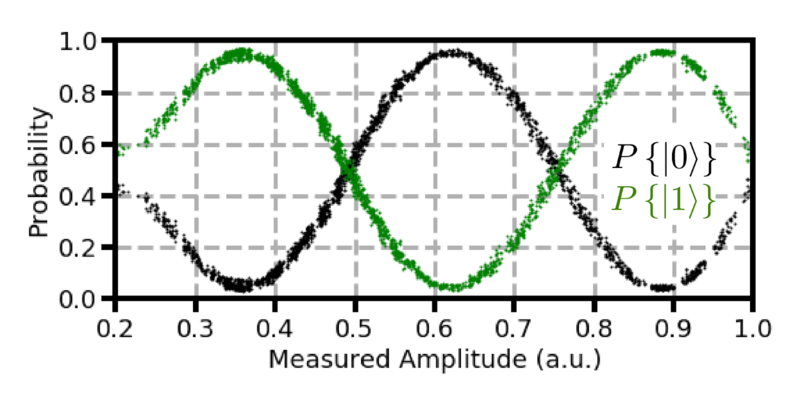 In our lab in Santa Barbara, we run programs on Bristlecone by applying gigahertz frequency analog control signals to each of the qubits to manipulate the qubit state, to entangle qubits and to measure the outcomes of our computations. How well we define the shape and frequency of these control signals directly impacts the quality of our computation. To make high-quality qubit control signals, we leverage technology developed for smartphones packaged in server racks at room temperature. Individual coaxial cables deliver these signals to each qubit, which are themselves kept inside a cryostat chilled to 10 millikelvin. While this approach makes sense for a Bristlecone-scale quantum processor, which demands 2 control lines per qubit for 144 unique control signals, we realized that a more integrated approach would be required in order to scale our systems to the million qubit level. 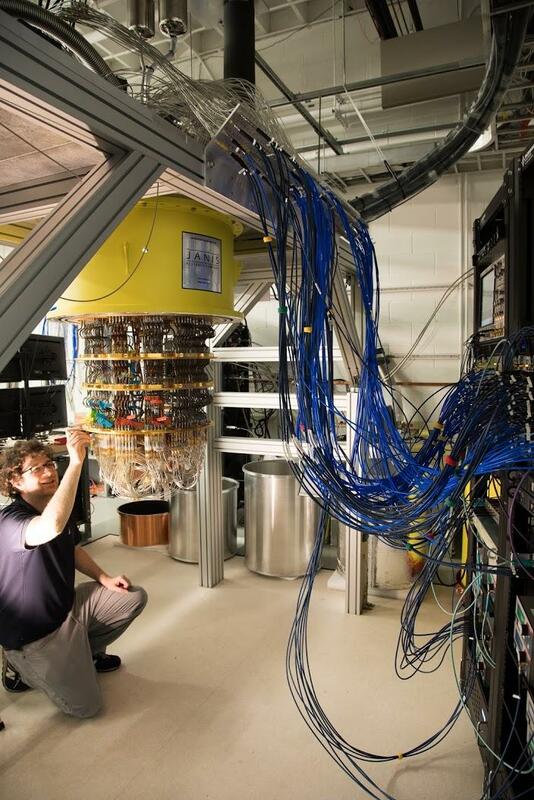 Research Scientist Amit Vainsencher checking the wiring on Bristlecone in one of Google's flagship cryostats. Blue coaxial cables are connected from custom analog control electronics (server rack on the right) to the quantum processor. In our current setup, the number of physical wires connected from room temperature to the qubits inside the cryostat and the finite cooling power of the cryostat represent a significant constraint. One way to alleviate this is to move the digital to analog control closer to the quantum processor. Currently, our room temperature digital-to-analog waveform generators used to control individual qubits, dissipate ~1 watt of waste heat per qubit. The cooling power of our cryostat at 3 kelvin is 0.1 watt. That means if we crammed 150 waveform generators into our cryostat (never mind the limited physical space inside the refrigerator for a moment) we would overwhelm the cooling power of our cryostat by 1500x, thereby cooking our cryostat and rendering our qubits useless. Therefore, simply installing our existing digital-to-analog control in the cryostat will not set us on the path to control millions of qubits. It is clear we need an integrated low-power qubit control solution. In collaboration with University of Massachusetts Professor Joseph Bardin, we set out to develop custom integrated circuits (ICs) to control our qubits from within the cryostat to ultimately reduce the physical I/O connections to and from our future quantum processors. 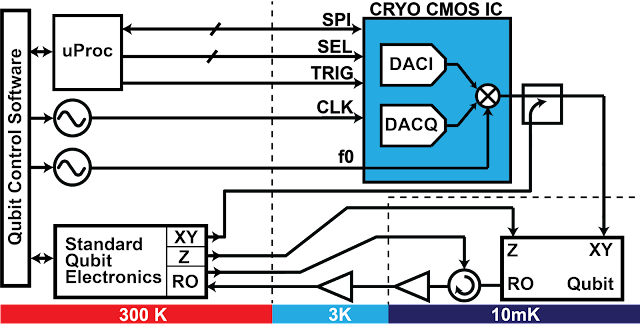 These ICs would be designed to operate in the ultracold environment, specifically 3 kelvin, and turn digital instructions into analog control pulses for qubits. A key research objective was to first design a custom IC with low power requirements, in order to prevent warming up the cryostat. We designed our IC to dissipate no more than 2 milliwatts of power at 3 kelvin, which can be challenging as most physical CMOS models assume operation closer to 300 kelvin. After design and fabrication of the IC with the low power design constraints in mind, we verified that the cryogenic-CMOS qubit controller worked at room temperature. We then mounted it in our cryostat at 3 kelvin and connected it to a qubit (mounted at 10 millikelvin in the same cryostat). We carried out a series of experiments to establish that the cryogenic-CMOS qubit controller worked as designed, and most importantly, that we hadn't just installed a heater inside our cryostat. Schematic of the cryogenic-CMOS qubit controller mounted on the 3 kelvin stage of our dilution refrigerator and connected to a qubit. Our standard qubit control electronics were connected in parallel to enable control and measurement of the qubit as an in-situ check experiment. Baseline experiments for our new quantum control hardware, including T1, Rabi oscillations, and single qubit gates, show similar performance compared to our standard room-temperature qubit control electronics: qubit coherence time was virtually unchanged, and high-visibility Rabi oscillations were observed by varying the amplitude of the pulses out of the cryogenic-CMOS qubit controller—a signature response of a driven qubit. 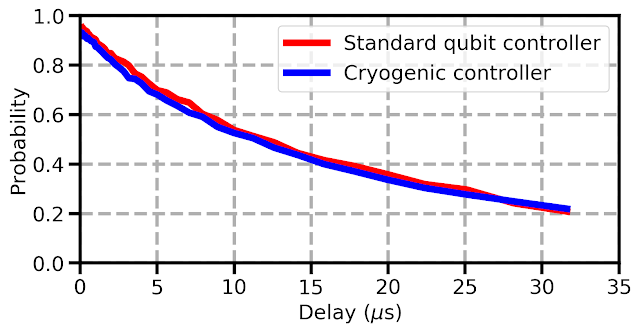 Comparison of the qubit coherence time measured using the standard and cryogenic quantum controllers. Measured Rabi amplitude oscillations using the cryogenic controller. The green and black traces are the probability of measuring the qubits in the 1 and 0 states, respectively. Although all of these results are promising, this first generation cryogenic-CMOS qubit controller is but one small step towards a truly scalable qubit control and measurement system. For instance, our controller is only able to address a single qubit, and it still requires several connections to room temperature. In addition, we still need to work hard to quantify the error rates for single qubit gates. As such, we are excited to reduce the energy required to control qubits and still maintain the delicate control required to perform high-quality qubit operations. This work was carried out with the support of the Google Visiting Researcher Program while Prof. Bardin, an Associate Professor with the University of Massachusetts Amherst, was on sabbatical with the Google AI Quantum Team. This work would not have been possible without the many contributions of members of the Google AI Quantum team, especially Evan Jeffrey for his integration of the cryo-CMOS controller into the qubit calibration software, Ted White for his on-demand qubit calibrations and Trent Huang for his tireless design rules checks.